Hyvää naistenpäivää! Ruusukortti kaikille upeille naisille! Ruusun ja kalvon alla pieniä helmiäiskukkia paljetteina. Happy Women's Day! A rose shaker card with pearly little flowers inside. I made this card for my old friend's big birthday. Diecut Background: Penny Black "Interlocking"
A stunning rose set off perfectly by the die cut background! Thanks for sharing with us at Stamping Sensations. Oh Mervi ... this is SO SO pretty! Beautiful coloring and design! Thanks so much for joining us at The Sisterhood’s ‘Celebrating Women’ challenge and please come back again soon! Stunning card Mervi. love the image and the die. A stunning red Rose Mervi, it really makes an extremely striking card, thanks so much for joining us at Stamping Sensations challenge. Stunning rose and a beautiful design! Thank you for joining us at Sweet Stampin' this week. Hello Mervi: This is a gorgeous card and, to top it all, IT'S A SHAKER!!! WOW!! love it. 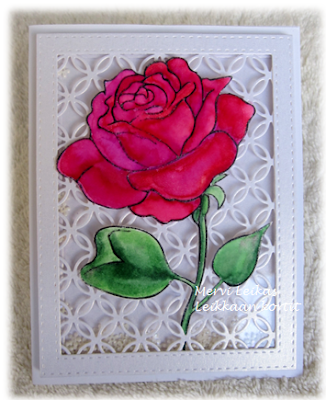 The lattice background is perfect for this lovely and beautifully colored rose. Thank you for sharing your stunning card in the NO DP challenge at Sweet Stampin! Simply stunning! The coloring of the Rose is so well executed. 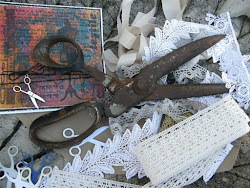 ..
such a pretty card :) thank you for playing along with us at simon says stamp wednesday challenge!